trash: Prevent a trace. That trace initiates again with a base trace strength of 0. 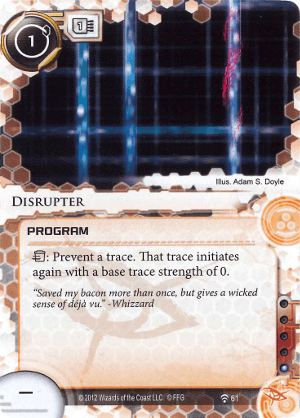 Sadly this card is a counter for nothing other than good times and game enjoyment, as the official ruling is that you have to use Fun Disrupter before the Corp declares his or her trace strength. This means if your opponent is Blue Sun, and they have more than god (and of course they will), this janky little piece of cardboard will spare you from exactly six of the 49 tags you were about to get from Midseason Replacements. Good to play if you would like to have an argument about the rules in the hopes of stalling the inevitable double Scorch headed your way. Combo with SMC and surprise your opponent. Congratulations! You now have three fewer to spend on preventing the next trace, which starts ...now! Can be combo'd with a Sharpie to make a Desperado proxy. Does nothing of any value. Even the art is nondescript, suggesting not even the makers of this card had any idea as to what it was supposed to do. I'm assuming this was a hard counter to SEA and (mainly) Midseasons. Cheap to splash too, so I guess it might make a decent 1-of in SMC-reliant decks not wanting to use Plascrete. For 1 credit (instead of 3), you can avoid those two threats (and for 1 MU, unfortunately). Unlike Plascrete, its viable against any large trace. Hello, Security Nexus, how do you do? Do you want to resurrect cards from the oblivion? Do you mean apart from Power Tap, which was almost forgotten? Fine! All for you! Take it and make it shine! Make profit from that forced trace!